On Saturday, October 20, the PA Wilds Conservation Shop at Kinzua Bridge State Park will host a “Fall Marketplace-Cornucopia of Craftsmanship” event from 10 a.m. to 4 p.m.
A variety of unique, handcrafted and locally-made gifts will be available, along with a food truck offering local fare. This is a perfect opportunity to shop local and avoid long lines and travel for holiday gift-giving needs. Tara Heckler of Blackberry & Sage Market in Punxsutawney, who creates organic, reusable, eco-friendly and compostable products for the home and body, from many sources, including beeswax, herbs and fiber among others. Teresa Genaux of Alpaca Creations, who hand knits apparel and specialty items with hand dyed and spun yarns all from Alpaca, including items such as hats, mittens and scarves. Rocky Holland of Eagle Eye Photography, out of Kane, photographs wildlife and scenic views from the Pennsylvania Wilds region and creates prints and postcards. Deb Ruhf of The Muddy Moose Bath Boutique, located in Penfield, creates handmade soaps. lotions, lip balms and skin creams made from locally sourced and natural ingredients. Debbie Penley, of White Oak Creations in Sugar Grove, makes various products and custom items out of natural materials, such as wool, felt, pottery, corn husks, yarn and wood. Jack Northrop of Kane turns unique bowls and vases from leftover or found local hardwoods, including burl, black cherry, walnut, maple, sumac and others. Dan Hibbard of Hibbard Distributing in Kersey offers many different condiments and sauces made with Straub American Lager. Stacie Johnson-Leske of Your Fired Pottery in Ridgway creates pottery products by wheel throwing lightweight, white stoneware ceramics, which are brightly colored using handmade glazes. The Smith family of Palace Apiary in Emporium offers award-winning local raw honey from treatment-free bees. 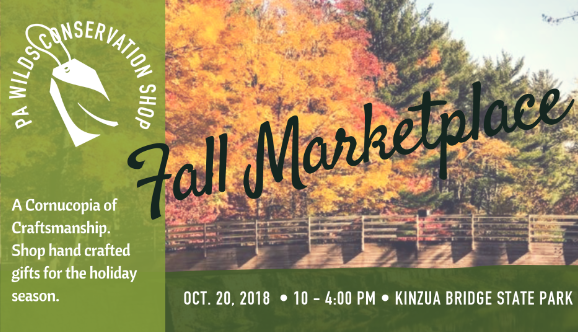 Experience the beauty of Kinzua Bridge State Park in the fall, and see what you can find at the Fall Marketplace on October 20.